Tired of replacing your decomposing deck? This time, don’t use wood. Composite decking isn’t wood, but it looks like it. And it may be a better option for your new deck. Composite decks last longer than wooden decks, and they are a lot easier to take care of. 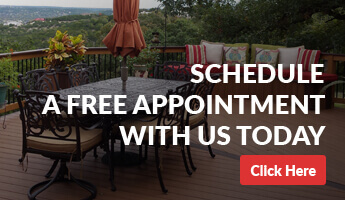 Check out this complete guide to installing a composite deck in your backyard. Composite decking is a material that looks like wood but isn’t actually made of wood. Instead, it is made from equal parts wood fiber and plastic. The wood fiber usually comes from the ground-up remains of wood and sawdust from places like mills or factories. The plastic is recycled plastic, taken from plastic grocery bags and water jugs. The wood fiber and plastic get mixed together with other pigments and preservatives. A woodlike texture is then carved or pressed onto the boards. That depends on the kind of composite decking you get. Some composite board designs look like the real thing, while others you can tell they’re not real wood. This is because, when composite decking was first manufactured, it only came in one style and one color: grey. Even still, people jumped on the opportunity to install the wood substitute. In the past few decades, composite decking has made a lot of improvements, and now you have the ability to make a deck in different styles. These styles can be broken down into three main generations. Generation 1: Because it was made with more plastic than wood, this generation of decking looked fake compared to real wood. There weren’t a lot of options or varieties. Generation 2: This generation was still made with more plastic than wood, and though it looked closer to real wood, it struggled to duplicate the right color tones and textures to look realistic. Generation 3: The third generation of decking copies the natural colors and textures of different woods. You can get a composite decking that matches the wood of your choice. Some manufacturers still sell generation two composite decking at a cheaper price than generation three. So if you want a composite deck and don’t mind if it doesn’t look like its made from real wood, you can save a bit of money with generation two composite. A deck made from generation three composite will have all the benefits of composite decking and still look as beautiful as real wood. Composite decking lasts a lot longer than wood and is easier to maintain. Once you install your deck, you don’t really have to think about it again. Because it’s not made completely of wood, composite won’t start to splinter over time. This means the kids can run around on the deck barefoot without worrying about getting splinters. Decks made of composite also don’t warp. This is helpful if you live in an area that gets a lot of rain. Composite doesn’t absorb as much water as wood which will keep it looking the way it should. After you install your composite decking, it will fade slightly during the first few months exposed to the sun. After that, it will retain the rest of its color. Wood will continue to fade throughout its lifetime, often turning a shade of grey. Unlike wood decks, a composite deck doesn’t ever need to be sanded, re-stained, or re-oiled to keep it in good shape. Composite won’t mold away or start to decay. The plastic inside means the composite decking can last a lifetime in the right conditions. Composite decking will burn, but it burns at a much higher temperature than wood. This is a good option if you do a lot of grilling on your deck and are worried the high temperatures could damage the real wood. To keep your composite deck in good shape, the only thing you need to do is give it a good wash once or twice a year. Just use a broom and a hose and scrub the deck down. This prevents a buildup of dirt and grime on the surface of your deck and keeps the composite looking bright. Mold is not a serious threat for composite decking, but if you install your deck in a location that is moist and shady, mold can grow on your composite. This mold won’t damage the composite decking the same way it eats through wood, but you can and should remove it with a specially designed cleaner. If you are concerned your deck is in a location that might encourage mold growth, you can apply a mold barrier to the deck as part of the installation process. Composite decking is more expensive than real wood (usually starting at around $4 a square foot for cheap composite decking and close to $8 a square foot for composite decking that closely imitates wood). But composite decking lasts a lot longer than wood and requires a lot less maintenance. While you’re paying more at the beginning, you’ll really save money in the long run. Because it doesn’t splinter like real wood, it is also a safe option for children or pets who may run or play on the deck without shoes. Composite is useful for more than building decks. You can use it to finish stairs, railings, benches, tables, treads, and posts. Composite decking can last through bad weather, a bit of mold, and lots of use. If you’re looking for a deck that doesn’t take a lot of work, you’ll want a composite deck. But composite decking expands differently than real wood, so make sure you have it installed professionally instead of trying to do it yourself. If you fit the decking incorrectly, it may sag or buckle. Ready to pick some composite decking for your new deck? 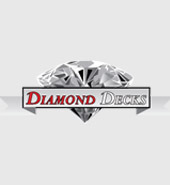 Check out some of our options here at Diamond Decks.